The storage system for highly radioactive used reactor cores at San Onofre is not "hardened" against anything significant. There are no active air defenses around it of any sort. Many people bandy the term "hardened" around -- using it five times in one report, for instance. But there is no legal or industry standard definition of "hardened" nuclear waste storage and if there were, San Onofre surely would not qualify. What some people are calling "hardened" is merely the necessary gamma shielding made of lead and steel a couple of inches thick, surrounded by a cement overpack that is three to five feet thick. They are NOT referring to spent fuel storage systems that can endure real-world conditions such as impacts from the turbine shafts of jumbo jet airplanes during accidental crashes or terrorist strikes, followed by the pooling and burning of 35,000 pounds of jet fuel. San Onofre's dry cask storage farm is directly under several major airline traffic routes, so either an accident or a hijacking could cause an impact. Nor are they referring to casks that can survive impacts from molten-metal penetrator bombs or carefully-placed shaped charges. Truly "hardened" dry cask storage would include, at the very least, grade-level or underground enclosures for each cask, with 20-foot-thick reinforced concrete roofs. The steel alone would cost billions -- and be money well-spent. There would be earthen berms between EACH cask, and jet-fuel run-off channels. And don't do this in an earthquake or tsunami-prone zone. And not near where people or animals are, or will ever be, although there is always a force which might strike at any moment and which can overcome anything humans might build: Locations under asteroid impact zones -- and who knows where that might be -- or on top of sudden volcanoes, or actually straddling an earthquake fault line, and probably a few others no one's thought of... Unlikely? Yes. Impossible? Far from it. What we have now is just shielding from gamma rays. To be truly "hardened" against realistic potential events, you need much, much more. And you need to find a way to pay for it. Forcing nuclear waste producers -- the electric utilities -- to create properly "hardened" storage -- on site or elsewhere --is too expensive to be part of an ongoing, profit-motivated nuclear fuel cycle. Most of them would have to constantly be purchasing more land. San Onofre hasn't got the space, that's for sure. But where does one put a "properly" hardened dry cask system? The only way to know the true size and cost would be to shut down ALL the reactors and stop making more "spent fuel." Then, at least the problem would be of a finite (though huge) size. At that point it might be possible to think logically about what to do with ALL the nuclear waste in the country and on the planet -- once and for all. It won't be cheap and it won't be easy. As a nation, we have done nothing about the growing problem of nuclear waste for 65+ years. Other nations do a variety of things -- wrong things. America's managed not to make THAT mistake -- and instead, has done as little as possible. Some nations are following our lead and are storing nuclear waste dangerously on site where it is made, regardless of the growing risk to the local population and to the planet. Waiting to solve the nuclear waste problem at some future date is potentially disastrous. The time for the best, strongest, most robust solution is now, when the waste is by far the most toxic it will ever be. We'll still need proper containments for today's spent fuel waste for hundreds of thousands of years, but even just a few centuries from now the overall radioactivity will be several orders of magnitude less than it is today. Many long-lived isotopes would still remain, but the short-lived fission products -- the dominant radioactive isotopes for the first few hundred years -- would exist at a fraction of 1% of their current levels. If those "short-lived" isotopes get out, a lot of permanent damage could be done to the gene pools of every organism on earth including humans. So early protection is vital: Robust, "hardened" storage in depopulated areas. And an absolute stop to the continued operation of these uneconomic, accident-prone death-machines known as nuclear power plants. In a free market, nuclear power would have died for financial reasons by now. But that's not happening fast enough, since various regulatory agencies keep the plants profitable for their owners. But every day the world continues to use nuclear power, the size of the problem the industry leaves behind increases by about 10 tons nationally and 50 tons globally. That's a significant amount, because spent fuel is so difficult, expensive and risky to manage. The spent fuel dilemma is a massive, hidden global problem. It's time to define "hardened" storage properly, in terms that fit the geological as well as the geopolitical realities of today. When it was announced on June 7th, 2013 that the San Onofre Nuclear "Waste" Generating Station (known as "SONGS" because the waste (W) was ignored) would remain closed permanently (after being shut down since January 31st, 2012), it instantly went from having been a "nuclear power plant" to being one of the largest nuclear waste dumps in America, in terms of the quantity of lethal poisons within its space. It continues to be one of the most vulnerable targets for terrorists in all the world. An article in today's Japan Times (below, from Bloomberg news service) says that Fukushima "may provide a blueprint for terrorists" for attacks on operating reactors -- since "all you need to do... is to cut off the power." It's not quite that simple: At Fukushima a contributing factor was that the entire area was in turmoil from the earthquake and tsunami. But if Japan should be worried about terrorism at nuclear facilities, doesn't it make sense that we should be, too? Of course it does. But in fact, anyone who knew anything about nuclear reactors -- which surely included the terrorists -- has known all along that cutting off the power to a nuclear facility could cause a meltdown. That's why for decades, activists have been trying to demand more robust backup power systems for nuclear facilities! Such enhancements were always deemed "too expensive" but in light of Fukushima, it clearly would have been worth it to spend the money. 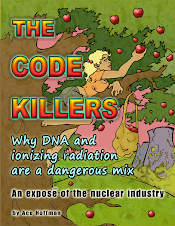 What Fukushima might have taught the terrorists is that it's the radiation that causes the financial and health problems. 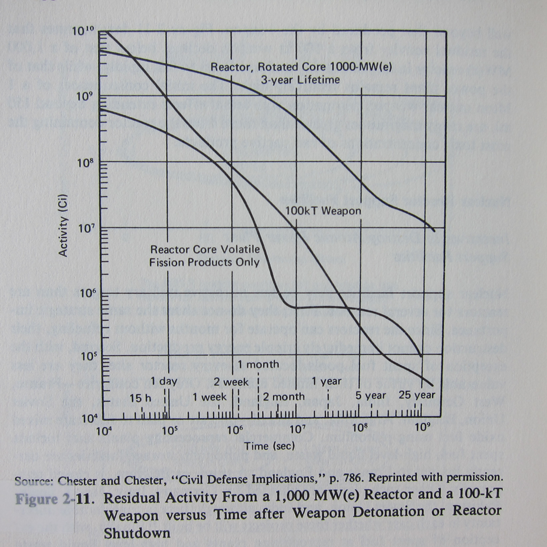 Destroying an operating reactor is one way to cause a radiation release, but attacking spent fuel pools or dry casks can work equally well for the purpose of causing widespread contamination and ensuing havoc, panic, and destruction. And lest we forget, neither Fukushima nor even Chernobyl were anywhere near a "worst case scenario" for those types of reactors. The majority of the plutonium and uranium remains -- in seething blobs known as "corium." One formation of corium at Chernobyl even has a name: The Elephant's Foot. It's crumbling. At Fukushima three reactors have turned to "corium." The corium blobs ooze massive quantities of radioactive particles constantly, and will continue to do so for decades millennia. And at both Fukushima and Chernobyl, things can still get far worse, and there's nothing anyone can do if that starts happening. Meanwhile, their precarious spent fuel pools remain loaded with fuel, 60 feet above ground level in earthquake-damaged, tsunami-damaged, and explosion-damaged buildings. All the spent fuel anywhere near the melted-down reactors should be removed from the sites immediately. But at any site, and at San Onofre in particular, terrorists or Mother Nature can damage a spent fuel pool or a dry cask farm, even if damaging an operating nuclear reactor is theoretically easier. A dry cask storage farm might have a couple of rent-a-cop security guards overseeing it, who are expected to "call for backup" if anything goes wrong -- assuming the phone systems are working. They are not expected to be able to fend off any significant attack by themselves. An operating reactor has nearly a thousand people working on site, and all of them are (supposedly) trained to be watching for "anything suspicious." There can be double that number of people or more, if it's a multi-reactor facility. While moving the waste several times is risky and should be avoided, waiting to move the waste to truly hardened, monitored storage, away from population centers, is even more pure folly: It is a gamble which could result in the catastrophic and sudden loss of tens of thousands of lives and trillions of dollars. VIENNA ­ The Fukushima No. 1 nuclear plant, whose 2011 triple-meltdown forced the relocation of 160,000 people, may provide a new blueprint for terrorists seeking to inflict mass disruption, security analysts said Monday at a meeting of the International Atomic Energy Agency. The U.N. atomic agency convened a weeklong meeting of 1,300 diplomats, scientists and security analysts in Vienna to examine ways to boost protection against nuclear terrorism. The meeting is the IAEA's first ministerial conference. "Fukushima sent a message to terrorists that if you manage to cause a nuclear power plant to melt down, that really causes major panic and disruption in a society," Matthew Bunn, a Harvard University professor and former White House adviser, said at a briefing. "All you need to do to do that is cut off the power for an extended period of time." Leaders across the globe have pledged to secure the world's loose nuclear material by 2014 to reduce the likelihood of an atomic attack by terrorists. While national nuclear facilities primarily endeavor to track the vast quantities of unaccounted for uranium and plutonium, some focus has shifted to the threat posed by power plants. Fukushima "has provided a number of findings and lessons that are also useful for preparations for an incident caused by human hand, such as a terrorist attack at a nuclear power station," said Shunichi Suzuki, Japan's envoy to the meeting. Japan's Atomic Energy Agency was scheduled to present steps it's taken to boost security against terrorism Tuesday in Vienna. The IAEA conference is taking place behind closed doors. "Fukushima is a nuclear security problem as much as it was a nuclear safety problem," said Kenneth Luongo, who with the U.S. Department of Energy helped secure atomic material in Russia after the collapse of the Soviet Union. The IAEA has projected nuclear power is set to expand worldwide even after the March 11, 2011, earthquake and tsunami sparked the triple-meltdown and radiation leaks at Tokyo Electric Power Co.'s Fukushima No. 1 plant. A nuclear-armed terrorist attack on the port in San Jose, California, would kill 60,000 people and cost as much as $1 trillion in damage and cleanup, according to a 2006 Rand Corp. study commissioned by the U.S. Department of Homeland Security. Even a low-level radiological or dirty-bomb attack on Washington, while causing a limited number of deaths, would lead to damages of $100 billion, according to Igor Khripunov, the former Soviet arms-control envoy to the U.S., who's now at the Athens, Georgia-based Center for International Trade and Security. 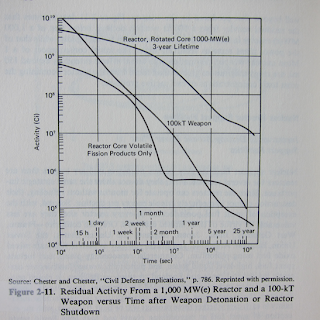 Because a terrorist needs only about 25 kg of highly enriched uranium or 8 kg of plutonium to improvise a bomb, the margin of error for material accounting is small. There are at least 2 million kg of stockpiled weapons-grade nuclear material left over from decommissioned bombs and atomic-fuel plants, according to the most recent estimates by the International Panel on Fissile Materials, a nonprofit Princeton, New Jersey, research institute that tracks nuclear material. That's enough to make at least 100,000 new nuclear weapons on top of the 20,000 bombs already in state stockpiles. And I'm pretty sure it didn't just send that message to terrorists. The entire population of Honshu North of Tokyo has probably also caught on. The nuclear industry has managed to do all that without the aid of any terrorists - stop obscuring the issue. Nuclear power stations on a tectonically active set of fault lines don't need any terrorism to go wrong. They just need time. It's a geological certainty. Barbara George: "I'm aware that casks survived Fuku. But will that always be so? Michael Welch: Why wouldn't it be. Not understanding the question. Michael, there are far too many variables to predict with any degree of certainty that dry casks currently housing spent fuel assemblies at SanO and Diablo would perform as well as the Fukushima casks should a big quake or tsunami hit in years to come. For one thing the large inventory of spent high burn-up fuel assemblies at SanO have cladding vulnerabilities yet to be fully understood - scientists suspect that as the assemblies age the cladding becomes increasingly brittle and problematic. Comments should be in good taste and include the commentator's full name and affiliation.